Claude Monet's painting Étretat: Sunset. Courtesy of the North Carolina Museum of Art, Raleigh; Purchased with funds from the state of North Carolina. Famed French Impressionist Claude Monet created a striking scene of the Normandy coast in his 1883 painting, Étretat: Sunset. Now, a team of Texas State University researchers, led by astronomer and physics professor Donald Olson, has applied its distinctive brand of forensic astronomy to Monet's masterpiece, uncovering previously unknown details about the painting's origins. Olson, along with Texas State physics faculty member Russell Doescher and Texas State Honors College students Hannah Reynolds, Ava Pope and Laura Bright, publish their findings in the Feb. 2014 issue of Sky & Telescope magazine, on newsstands now. "Claude Monet, founding member of the Impressionist movement, painted a dramatic scene on the Normandy coast," Olson said. "The canvas shows the orange disk of the Sun sinking toward the horizon near a spectacular line of cliffs. "We like to use astronomy to show students how science can solve real-world puzzles," he explained. "We asked, 'Could we use the dramatic rocks in the landscape and the position of the setting sun to determine where and when, specifically, Monet created this beautiful masterpiece?'" Monet painted a series of paintings featuring this stretch of the Normandy coast during his three-week visit to the area during the winter of 1883. With Étretat: Sunset, Monet painted a cliff known as the Falaise d'Aval along with the arch Porte d'Aval overlapping a tall, needle-shaped rock spire known as Aiguille (the Needle) that stands just offshore. Key to the image, however, is a low, setting sun just to the right of the landforms. 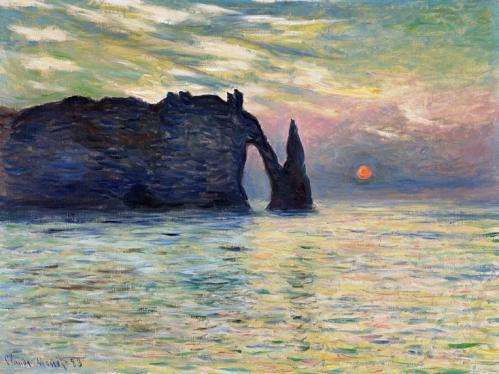 Of all the paintings Monet painted at Étretat, this is the only canvas that includes the disk of the sun, and that one detail opens the door to date the scene precisely. To determine on which days in February the sun would've set in the proper location for Monet to capture in his painting, the team of Texas State researchers traveled in August 2012 to France. Previously, art historians wrote that the scene had been painted by Monet standing just a few yards from a small arch called Porte d'Amont to the northeast of Étretat. 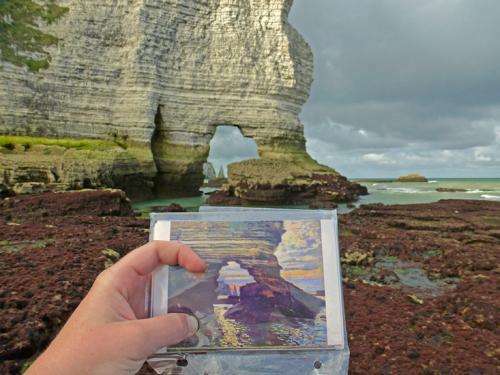 But Olson quickly determined that for an observer in that location the Porte d'Aval and Aiguille do not overlap, and another rock formation is visible through the Aval arch—clearly a different view from Monet's. The research team made extensive topographic measurements of the terrain at Étretat. To determine the exact locations where Monet stood, they walked systematically from one end of the beach to the other at low tide, armed with postcard-size reproductions of about a dozen Monet paintings of the area. They located the precise vantage points from which Monet created the various paintings. "We were going out there at low water—it's just safer that way," Olson explained. "You don't want to get caught on these beaches at high tide. "Ava is accustomed to difficult hiking terrain, and she said that the beaches near Étretat had the most difficult footing she'd ever been on in her life. It's really tough," he said. "And as you get farther out, it gets worse, because it's slippery, with the rocks covered with seaweed that's still wet from the previous high tide. Here's the thing that we realized from this research trip—Monet went out there with all of his painting equipment!" 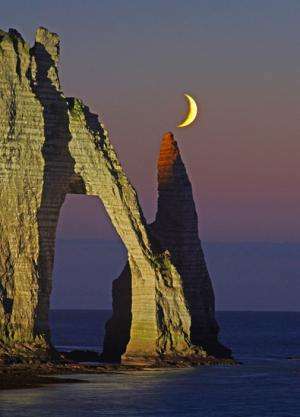 The Texas State team found that the view matched the scene depicted in Étretat: Sunset at only one location—a spot 425 yards from the Porte d'Amont on a rocky beach under an overhanging cliff. The researchers used planetarium software to compare the modern sky to that of the 19th century. Since the Texas State team visited in the summer, the sun was out of position to replicate the sunset from Monet's painting. The waxing crescent moon, however, offered a convenient stand-in during the early evening hours, and star-fields became visible after moonset. By determining an astronomical coordinate called declination for the moon and stars, they were able to calculate the sun would have set along that path on Feb. 5, 1883. Allowing for some uncertainty, the researchers concluded that the correct date must fall in the range between Feb. 3 and Feb. 7, 1883. The Texas State group carried postcard-sized prints of the paintings and used them to find dozens of Monet's locations during the Aug. 2012 visit to Normandy. For the canvas known as W258, the Porte d'Amont, Étretat, this matching photograph looks to the southwest as the small Amont frames a view of the distant Needle. The group then combed through letters Monet wrote from Étretat during his stay, along with weather records and tide tables from February of 1883 to confirm their date. They discovered that on Feb. 3 Monet was working on nearby Jambourg Beach and that the artist spent all day Feb. 4 entertaining his visiting brother. The tides of Feb. 6 did not match the painting, and Monet's letters show that he paid close attention to the tides. On Feb. 7 cloudy weather and rain storms began. Through the process of elimination, the calculated date of Feb. 5 is the only one remaining that matches the sun's position, the weather and the tide level in the painting. Armed with that knowledge, the Texas State team used the height of the needle-like Aiguille formation to calculate the exact time from the altitude of the sun above the horizon. "We were able to determine the month, day, hour and precise minute—accurate to plus or minus one minute—when Monet was inspired by that beautiful scene," Olson said. "Monet observed this sunset on Feb. 5, 1883 at 4:53 p.m. local mean time." In addition to publication in the February 2014 issue of Sky & Telescope, the research into the Monet painting is one of two new projects included in Celestial Sleuth: Using Astronomy to Solve Mysteries in Art, History and Literature, out now from Springer Praxis Books. The book collects many of Olson's past forensic astronomy studies published over the past 25 years, including such topics as the Boston Tea Party, Julius Caesar's invasion of Britain, the first Marathon run in ancient Greece; the works of Mary Shelley, Shakespeare, Walt Whitman, Omar Khayyam and Geoffrey Chaucer; and night skies depicted by artists such as Edvard Munch, J.M.W. Turner and Vincent van Gogh. How do we know that Monet didn't place the sun where he did for artistic purposes rather than verisimilitude. ?